and there is no blemish in you." When Debbie and I got married on March 15, 1986, we were so excited about starting our lives together as husband and wife. The first order of business after the wedding was the honeymoon. YES!! I was so excited about the honeymoon. I think most brides dream about the wedding – and most grooms dream about the wedding night. It is just the way God made men and women. Debbie and I got to go on two honeymoons. The first one was a short, two night stay in Galveston, TX. Debbie got sick the second night and threw up for hours. It was so romantic! The second one, a week later (Debbie taught school and her spring break was a week after our wedding), was in Monterrey, CA. We had so much fun. We walked on the beach, ate seafood while looking out at the Pacific, shopped (my least favorite thing), and talked and shared over a romantic fire each night. We did not want the week to end, and we definitely did not want the honeymoon to be over. Now while it is true that no one can actually live on a perpetual honeymoon vacation, it is also true that the marital honeymoon does not have to end just because you come back home. God has designed marriage to be a wonderful experience of love and joy and fulfillment. Of course there are ups and downs. Of course there are adjustment times and hard times and sad times and mad times and AARRGGHH times!!! But if you go God’s way, those times can be overshadowed by the love and laughter. It is sad to see so many marriages fail. A majority of the prayer requests we get at From His Heart concern hurting marriages. It is tragic that many marriages within the church are distant and cold. The husband and wife co-exist as roommates, living separate lives with no closeness and little, if any, love. Typically, these couples stay together until they cannot stand it anymore. When they divorce, they create a new set of problems and hurts. It is sad. It’s all too common, and it is completely avoidable IF YOU WILL START GOING GOD’S WAY. Let me encourage you. If you are growing miserable in your marriage, the time is NOW to do something about it. The time is NOW to get some outside help. Reject the hellish idea that marriage counseling is only for wimps and losers. Marriage counseling is for people who are honest enough to say, “I need some help.” No one would think twice about going to the doctor because of a broken arm. Why would we think it degrading or distasteful to get help for a broken marriage? Family Life Ministries is a great resource for marriages in need of encouragement and assistance. Find a Weekend to Remember Marriage Conference near you. Trust me; you won’t be disappointed. The conference helps good marriages get better, and bad marriages get good. Note, Debbie and I will be speaking at the Family Life Weekend to Remember Conference in Pittsburgh, PA November 10-13. If you live anywhere near there, we would love to see you. God really works when we as couples get away to focus on our marriage. There is a reason God had you read this e-mail. He wants to turn things around in your marriage. Will you trust Him to do so? Will you take that needed step of faith so that He can start a great work in you? Remember, Peter never would have walked on the water had he not gotten out of the boat! P.S. Get a FREE download of the booklet Debbie and I wrote called I Still Do. I believe it will be a blessing to you. And look for more marriage and family helps below. I’d also love to hear your comments at pastorjeff@fromhisheart.org. 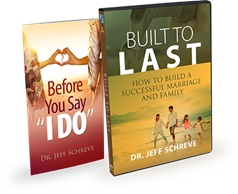 FOR A DONATION OF ANY AMOUNT, we’ll say thanks with Pastor Jeff’s booklet Before You Say “I Do”, plus the brand-new 6-message CD Series - “Built to Last: How to Build a Successful Marriage and Family.” Click for more information. The best way for a marriage to be great can be boiled down to this: making a good choice in who you marry. In this insightful new booklet from Pastor Jeff Schreve called BEFORE YOU SAY "I DO", he gives several critical components single people should consider when making that crucial choice of who to marry. This choice is meant to be a permanent one, so shouldn't you make sure it's the best possible choice you can make? And in his brand-new series on marriage and family called BUILT TO LAST, he shows us how the bedrock institution of life and society is the family. Marriage and family are the first institutions the Lord established at the dawn of civilization. And He created them to last the test of time and troubles.